Digital Risk is a leading next-generation integrated portfolio management solutions provider to the $4.2 trillion residential mortgage industry and broader credit risk market. Digital Risk is the only company in the market that combines proprietary predictive modeling analytics with expert forensic underwriting services, thus providing its clients an integrated 360° portfolio management solution to maximize returns and minimize losses. The Company’s predictive analytics, when integrated with its asset management services, delivers an effective set of solutions that minimize credit risk, pinpoint and prevent fraud, identify and execute loss mitigation and asset recovery opportunities, execute loan repurchase and loss indemnification, ensure regulatory compliance, assure quality, and maximize portfolio returns, among others. The Company has an impressive customer base comprising many of the most recognized financial institutions in the U.S.
Boxwood Partners advised Digital Risk, LLC on growth capital investment from Century Capital Management. 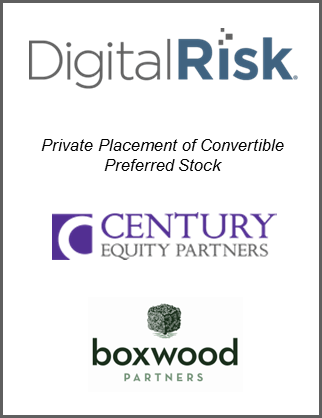 Boxwood Partners acted as the exclusive advisor to Digital Risk, LLC with respect to the transaction. The investment was made in the form of convertible preferred equity.